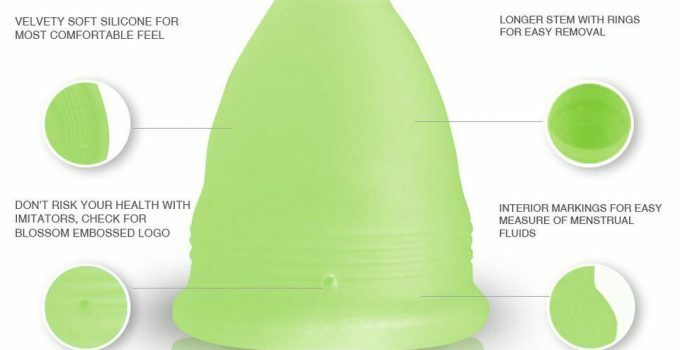 The Blossom Menstrual Cup has a short stem that should never need to be trimmed. Most women will never feel it once the cup is properly inserted. The material is soft and pliable, meaning that it will work well with any fold that you prefer. If you’ve used cups before and have a certain way of inserting them, you’ll be able to do the same with this one. The instructions are very easy to understand. If it’s your first cup, you won’t be left with any questions at all. The capacity is great when compared to similar cups. The quality is very good when compared to other cups at the same price point. The Blossom Cup has a relatively shorter lifespan than similar products. It won’t last as long as some of the others, but that’s reflected in the overall price of the cup. The Blossom Reusable Menstrual Cup is a great choice, especially is it’s your first menstrual cup. It comes with a full set of instructions so you’ll never be lost for information. They’re made in the United States of America and are FDA approved, so you know that you’ll always be safe when using it. The capacity of the cup will allow you to wear it for a full day before you have to empty it. On top of that, it’s going to last you for a few years. That means you’ll end up saving hundreds on pads and tampons throughout its life. Whenever your cycle is about to begin, you’ll be able to move forward with the confidence that you’ll never have to deal with any leakage. The material lends itself very well to creating a tight seal that will never fail. No matter how active you are, this is the cup for you. This Blossom Cup Review will focus on all the information that you need to make an informed decision on your purchase. Whether you’re searching for your very first cup, or you’ve been using them for years, you’ll know everything that you need to know. It will look at the technical specifications of the cup, as well as the general feeling towards it from women who have used it. Everyone has their own opinion and you’ll be able to see for yourself how they all stack up against each other. All of the information in this Blossom Menstrual Cup Review has been taken from real sources to make sure that it’s accurate for you. The company information comes from what they have to say about themselves and the promises that they make to their consumers. The Blossom Reusable Menstrual Cup is made in the United States of America and the company that sells it stands by their quality. They strive to make the world a better place to live and always put the women who use it first. It has a great capacity and can be worn all day long before it needs to be emptied. The material is manufactured to be clean and safe all the time. It will never cause any discomfort or irritation. You’ll never have to worry about getting an infection. No matter how active your lifestyle happens to be, it will remain well seated where it’s supposed to be to protect your leaks. It’s easy to use and comes with a full set of instructions to get you started. Once you learn how to use it, you’ll never want to go back to using pads or tampons again. It’s the safest and most reliable way to care for your cycle. The Blossom Reusable Menstrual Cup has a lifespan of one to three years with proper care. One cup can save hundreds and reduce the waste of pads and tampons. It’s pliable and feels extremely comfortable to use, while still providing plenty of support and peace of mind against leakage. The medical grade silicone is FDA approved and totally free of BPA and other dangerous materials. It comes in several different colors and two different sizes to fit all women. No matter what you’re looking for in a cup, chances are good that you’ll be able to find it with this company. The Blossom Menstrual Cup comes in nine different colors, two different sizes and in two different options. The colors are green, orange, pink, yellow, red, clear, blue, black and purple. All cups come with instructions and a cotton drawstring pouch for storage. They can be purchased on their own or with the Blossom Cup cleaner. Cleaning the Blossom Reusable Menstrual Cup is always easy. You can do it at home or on the go in a public restroom. Wash your hands in warm water with soap. Remove the cup and dump the contents into the toilet. Wash the cup in warm water with mild, scent free soap. When you’re on the go, all you have to do is wash your hands in warm, soapy water before entering a public stall. Remove the cup and flush the contents. The Blossom Menstrual Cup can be stored in a well-ventilated place in between your cycles. It’s important to sterilize it before you use it again after your cycle ends. Hold the cup in the water with tongs. Don’t let it touch the sides or bottom of the pot. Remove it after 5 – 7 minutes. Let it cool completely before handling. The Blossom Company is run by women, for women. It was created by two mothers who were inspired to do something positive for the environment. They believe that pure solutions are always the best solutions, which is why their cup is made with the best medical grade silicone. Their mission is to provide a healthy and sustainable sanitation solution for women all over the world. The vast majority of women who use the cup absolutely love it. They love that it’s an ecologically friendly way of taking care of their cycles when the time comes. Given the several year lifespan, they’re also saving plenty of money on pads and tampons. The waste that they create is diminished down to zero and they have the peace of mind of doing something great for the Earth. They call it a win/win scenario when everything is considered. A lot of women also talk about the fact that the instructions make insertion and removal incredibly easy. The directions are easy to understand and it doesn’t matter if they’ve never used a cup before. It’s very comfortable to wear, and most say that they don’t feel a thing once it’s properly seated. It doesn’t take much to learn how to use it; the website has plenty of extra information if it’s ever needed. Some are skeptical about the cup before it arrives, but once they get it, they’re very happy with it. Most say that they’ll never go back to using pads or tampons again after they find out how easy it is. How long is the stem? The Blossom Cup stem is very short. It’s only 10 mm long, so it should never have to be trimmed. The vast majority of women will never even feel it once it’s inserted. Can I use it if I’m a virgin? Yes, the cup is for all women. The smaller size is especially suited for women under the age of 30 who have never given birth or are virgins. Is it easy to insert and remove? Yes, the Blossom Cup comes with a full set of instructions to get you started. Once you understand how to use it, you should never have a problem with it. The Blossom Reusable Menstrual Cup will last for up to three years with proper care. As long as you wash it and sterilize it, it will always be ready when you are. Yes, the cup comes in several different colors, including clear. Simply make your choice at the checkout. The cup is made of medical grade silicone that will always keep you safe during usage. It fits well and you’ll never have to worry about leaks.